It is a rare event when you are fortunate enough to be a part of releasing a piece of history to the public. 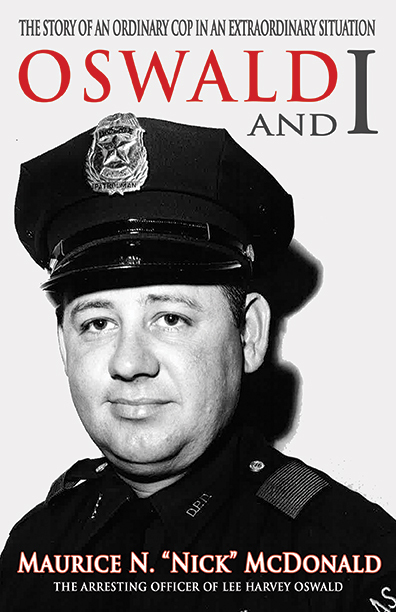 While conducting research for a historical novel, Ashley Fontainne had a chance meeting with Daisy McDonald, the widow of former Dallas Police Officer Maurice N. “Nick” McDonald. 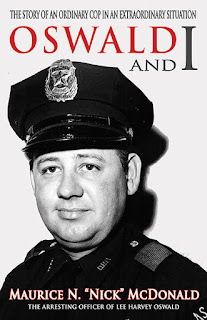 Mr. McDonald had written his memoirs about how his life was impacted from the moment he arrested Lee Harvey Oswald at a movie theater in Dallas. Sadly, Mr. McDonald passed away in 2005 and his heartfelt, 300+ page story sat unread inside a thick binder. Ashley met Daisy McDonald in Hot Springs, Arkansas in April of 2013 after a speaking/fact finding engagement. After the meeting, Daisy approached Ashley with questions about her experiences in publishing. They immediately hit it off and talked several times over the course of the next few weeks when she offered Fontainne the unimaginable: she wanted Ashley's Press, RMSW, to publish her husband’s work. So, it is with humility, thankfulness and a sense of duty to honor one of Mr. McDonald’s dying wishes that Ms. Fontainne brings to you the amazing cover (designed by the team of professionals at Blue Harvest Creative) for Mr. McDonald’s novel, Oswald & I, as well as the book trailer. Look for the paperback and ebook on Amazon, Barnes&Noble and Kobo November 2013.